This house is situated relatively high up in the hills of Constantia. Here, the fall of the land starts to flatten out from the Table Mountain range in the west towards the Cape Flats relatively far away to the east. In a north-south direction, there are a series of hills and valleys all draining in an easterly direction.Topographically, the landscape offers the dramatic horizon line of the Table Mountain range to the west, with the possibility of distant views to the north, east and south.The area is relatively sheltered from severe winds and storms, while the nutrient-rich soils and good rainfall ensure lush and abundant vegetation. Despite continuing residential densification, the area still offers a life of rural bliss in a blessed natural condition. It is a romantic landscape that has been immortalised by many authors and artists, in words and images, over a long period of time. Living in this part of the world is the desire of many and the privilege of the few. The house in Brommersvlei Road is situated on a rehabilitated south-facing slope. The site is heavily wooded, with well-established trees. It all focuses on a mountain stream on the southern edge.The site is a subdivision of a larger piece of land, and it used to accommodate a tennis court and lawns. Much work has been done to rehabilitate it and bring it back to, as close as possible, its near perfect natural condition, where fauna and flora can proliferate and where nature can reign supreme. The most precious aspect of the site is the southerly slope and views towards the mountain stream at the bottom thereof. To the north, from where the sun shines, the traffic noise from the road had to be contained. The site is the proverbial clearing in the forest. We also know from our long collective history that it is also precisely at the edge of the forest, where forest and savannah meet, that mankind (and architects) have been at their most prolific and inspired about the advancement of humankind and of architecture (shelter) at the same time. It is as if the interaction between both the forest and the savannah provide us with the best of many conditions for both material and psychological advancement. This fortunate environment provides both freedom as well as responsibility towards the preservation of abundance. Both elements-freedom and restraint-are evident in this building in the work of the architects. All has been done to effect privacy and visual protection, as well as the life-giving sunlight from the north, while directing attention to the bounty of nature in the south.The architectural means and vocabulary are relaxed, while staying mindful of keeping it minimal and contained. The architects' conceptual drawings and ideas, of a series of vertical and horizontal planes loosely arranged to allow light and views in between them, have been masterly realised in the final built product. The floor plane has been arranged as a series of discrete platforms closely following the site contours. In a similar manner, the roof plane is one continuous element with the same incline and direction as the fall of the land.The roof plane is also consistently disassociated from most of the vertical elements, using light to create an image of weightlessness, so that the roof hovers in the air seemingly devoid of the laws of gravity. 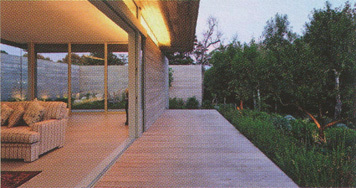 This light and tranquil building positions all place emphasis on man's restorative relationship with nature. Nature is the ultimate ideal while the architecture of this house follows its rules. Much has been done to support this idea of weightlessness. For example: the roof is always lit from below; internal and external walls hardly ever touch it; 'heavy' elements like a stone-faced fireplace are hung from it and do not touch the floor plane; the floor level (base) hardly ever touches the ground; and the sky dome is invited in by means of skylights and gaps between vertical and horizontal elements. The finishes, detailing and tectonic expression are muted and meticulously executed. They do not draw attention to themselves, but support the bigger concept of the house. The whole building exudes a quiet and reserved 'lightness of being' It does not limit the human spirit in this natural Eden it sets it free. It is like a temporary and sometimes romantic nomadic tent on the landscape. In the philosophy of architecture, reference is often made to 'Adam's House in Paradise' Here, we can speak of 'Adam's tent in Paradise'! Sometimes this dictum refers to the primordial elements of architecture in space and time. This house by Metropolis Architects could be seen as a contemporary interpretation of such elements.